This entry was posted in Pasta/Rice/Soups (Primi Piatti), Personal, Vegetarian and tagged Cooking, family recipes, Food, Italian, Pasta, Recipes by ChgoJohn. Bookmark the permalink. What a wonderful feast!! Your Zia’s traditional Bartolini risotto looks delcious, I couldn’t help but laugh at your suggestion of telling people who don’t like chicken gizzards into fooling them to belive it’s dried mushrooms. It’s certainly a case of what you don’t know wont hurt! Thanks, Lisa. The risotto recipe is truly something special, though I never realized how special until I moved away. You just don’t see “Risotto with Chicken Gizzards” on many menus. As for the mushroom trick, that was one my Mom used — and to great effect! Welcome home John!! I did wonder about the photo Celi published: could not quite make it out [Methinks all of us are relating to the waterlogged farmy and being virtually electrocuted!] : you know I’m glad you were not at home during the storm as you could not have helped an iota! So good luck with the landscapers who daresay will all be busy for weeks and want an arm and a leg!! And look at the positive side: you can draw up a new garden plan 🙂 ! Sorry about being washed out at Zia’s also, but all that food sounds so moreishi, especially that risotto !! Of course you shall all benefit, though, I bet we eat plenty of salads my next visit. We can’t maintain the pace of this last visit! 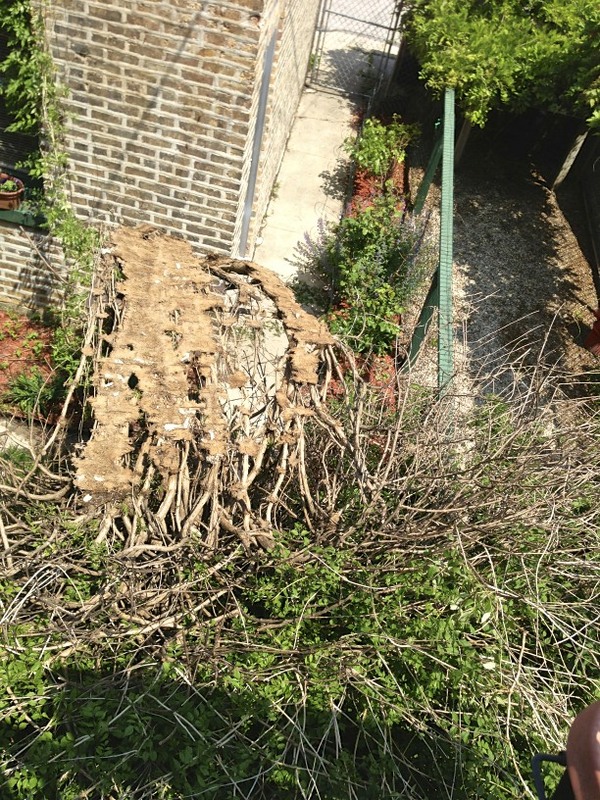 Sorry about the storm damage but look on the bright side, you’ll get a new clematis! Welcome home John,you have got a great zia,Great to see that!!! What an amazing holiday! And what an amazing feast! There was a story behind the photo you sent to Celi! I was so happy to see a pic of Max, I didn’t even think about the circumstances. Your Spring vacation sounds delicious… and afternoons chatting over the pasta board preparing dinner, wonderful. I agree, WP via smartphone is do-able only to a point. Similarly in Australia, as soon as you venture outside main areas internet coverage still in the dark ages. It was a very nice holiday, EllaDee. My Zia is game to try anything. if I suggest we try something, she’s all for it. We really do enjoy our time at the pasta board together. Australia, being so vast and relatively sparsely populated, would definitely have areas of poor internet coverage. Though there are many advantages to country living, internet service certainly isn’t one of them. I’m just glad my cell phone works. For a number of years, my cell phones wouldn’t work in that area — and I tried 5 companies before finding one that did. Welcome back – we missed you! So sorry about the storm damage, but at least you are being optimistic about what comes next. It was nice to get some shots of your view, I feel like I could be sitting looking out your window with you (with a glass of wine in my hand of course) helping you decide what to plant next. It looks like you and Zia had a wonderful time together, I love to see the closeness and love that the two of you share and the fact that she still gets enormous pleasure out of cooking and eating with you and her loved ones. I haven’t had breakfast yet, but those asparagus and egg would go down a treat right now 🙂 Hope you get settled back in ok and thta it doesn’t take too long to sort things out in the yard. Thanks, Tanya, for the welcome and your concern. That evening’s storm must have been a good one. Some of the streets in this area were completely blocked by fallen tree limbs and homes were damaged by fallen trees. I really am quite lucky that nothing was damaged other than a vine. How wonderful…am off shopping tomorrow so will look for some asparagus and see if I can cook the same and raise a cup of coffee or a glass of wine to you and Zia! Sorry I’m so late getting back to yo, Tanya. I hope you enjoyed the asparagus and I’ll be toasting you and Big Man with tonight’s nightcap. Salute! Sounds like a wonderful trip even if the weather was not quite as cooperative! Spending time with close ones makes the weather not as significant! And the food you enjoyed making and eating looked delicious! Good luck with your storm damage! Thank you so much. Yes, the time spent with Zia was certainly time well-spent. With so may people displaced because of some truly horrific storms, my “vine problem” is really nothing. I hope to get it pulled and out of here before the weekend. Fingers crossed! The food you ate on your break certainly looks yummy! Thanks, Colline. If I hadn’t come home when I did, Zia and I would have had to start dieting! I would not be surprised. I know that good food also encourages me to overheat! That’s very kind of you to say, Laura. Thank you so much. Sorry I wasn’t more clear about the vine. Since then, I’ve been able to create a path under it and we can get to the garage and alley now. 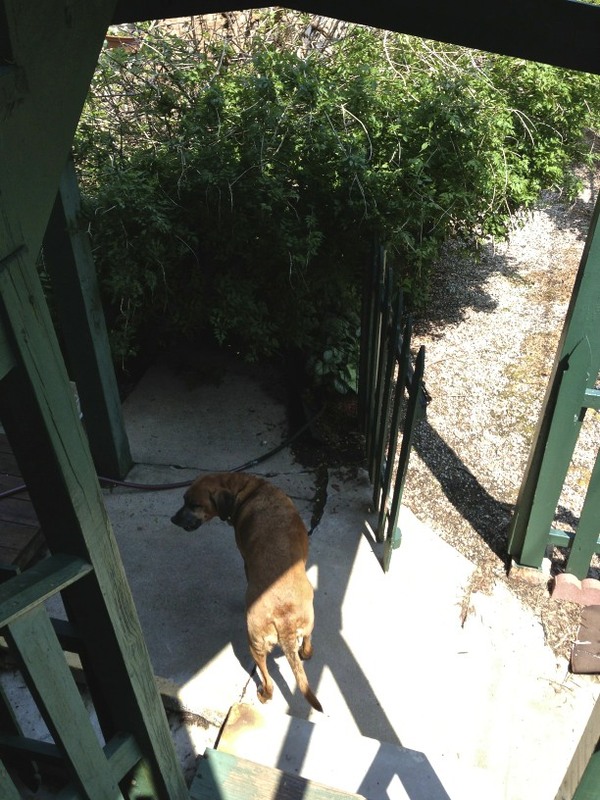 More importantly, Max can get to the back gate when he’s on patrol. It drove him nuts that he couldn’t get to the gate to bark at anyone or anything moving in the alley. Tomorrow I’ll continue calling places to get some help. WIth a little luck, all will be back to normal by the weekend. Have a good morning! Yay! The roses are back! I can’t wait to be formally introduced. Your visit sounds great; there’s nothing better than time in the kitchen with like minded folk. And pasta pillows sound so lovely, I think I’d like to sleep with one under my head. Welcome back! Holy cannoli, looks like you had a great with Zia cooking and eating! Glad you did not have excessive structural damage, and that no one was hurt. We can repair damage.. it’s a pain, but doable. You know better than most, Sally, how bad things have been for those poor people in the Heartland. This vine is nothing but a nuisance, in comparison. From what I’ve heard, the night of the storm, some streets were blocked by falling limbs in this area and some homes damaged by falling trees. Even so, it’s a far from what Oklahoma has endured. Thanks, Sally, for leaving such a nice comment and expression of concern. Welcome back. Sounds like a nice trip despite the ill weather. I don’t know why, but I am so pleased you honor Zia the way you do. Sorry about the trumpet vine… a climbing rose would be nice! Considering the other damage in the area and elsewhere, the loss of a trumpet vine is really nothing. I remember all too well the damage your property and area sustained last year. This is really nothing at all in comparison. Glad you are back safe and well. You certainly ate like a King while away! I loved the picture of Zia – such practiced hands. Looking forward to your new recipes. I hope the storm damage gets sorted quickly. I loved your post today! Can’t wait for some of those recipes! I live in the Ann Arbor area and also went morel and ramp hunting on some family property north of here. Even when you don’t find much, it’s always a good time. Oh, and as we speak, I have my first batch of chèvre draining from raw goat milk! Yay! Also, I am so glad there wasn’t a lot of damage to your home! I read your post about morel hunting and you were very successful. I wish I could have said the same. I envy you your raw goat’s milk. I just can’t get any raw dairy of any kind. It makes such a difference in taste when making cheese of any kind. Thank you for visiting and taking the time to comment. Enjoy that chèvre. Yum! Sounds like you had a great time with your Zia even if the weather didn’t cooperate. Glad the winds didn’t do more damage. Looking forward to all the recipes. Welcome back! Sounds like you had a terrific time. Sorry to hear about the damage, but thank goodness it’s not worse. Love all the recipes. You’ve reminded me it’s been ages since I’ve made gnocchi. The risotto recipe sounds like a winner – eagerly awaiting the post where you share details. 😉 Really fun and entertaining post – thanks for sharing your vacation with us. Thank you so much, John. It was a fun trip. Zia and I really do enjoy our time together in the kitchen. It had been a long time since we made gnocchi, too, and we were surprised at how good they were. It looks like I won’t be buying them anymore. Ours were so much better. Thank you. That photo is my favorite, as well. What a wonderful time away with your Zia….this post has left me feeling very hungry. I will be awaiting all the recipes, but especially the one for the gnocchi. Thank you, Marie. It was a very nice visit. Frankly, if the weather had been better, we may not have had the time to cook. Things worked out just fine. Believe me, I know all about those roots. I’ve got little trumpet vines popping up all over my yard and in the neighbors on either side of me. I even found one in the alley. That’s why I want the vine pulled and not tied back up to the garage wall. I thought they would draw hummingbirds. In the dozen years since I’ve planted them, I’ve not seen one hummingbird in my yard. It’s time for a change. the food looks simple, but elegant! and she can sing too! Thank you, Maria, and you are so right. There’s nothing like famiglia. We are very much blessed. Compared to some of the other damage in the area, not to mention in Oklahoma, this vine thing is just an inconvenience. Now if I can only find someone to remove it. I’ll be calling the 5th company tomorrow. Fingers crossed! You are so right! This was a wonderful visit home. What a perfect vacation John, bookended by Manhattans and cannoli! The ravioli looks perfect and delicious. My mum cooked us chicken gizzards when we were growing up, and although I loved them, I haven’t touched them since. Your simmering pot looks great, and I’m tempted to give them a burl after all these years. I am glad you had a chance to spend time with your Zia. I got a new phone and found that it won’t download the videos I put in my post. Have to go to the YouTube site to see it on the phone. Sorry to hear about the damage to your home. The food in this post looks wonderful. Can’t wait for the future recipes. Thank you so much, Francine. We had a wonderful visit together. So sorry to read that you cannot view you own videos. Is there a software upgrade or app that will help you to do it? I certainly hope so. I guess you did some eating on vacation! Wow, I wouldn’t mind a vacation like that. Sorry to hear about the storm damage but glad that it was minimal (that is a strange looking creature on your trellis. Zia sounds like the perfect hostess & I’m guessing that she was thrilled to see you, rain or shine. Thank you, Diane. You’re so right. Zia would have welcomed me no matter the weather. We do have such a good time together and making pasta is the highlight. I guess with all the storm damage, that business must be good for them right now but it is very annoying to not get call backs. Call number 5 was the charm, Diane. They were here within an hour of my call this morning and the vine was chopped and dug out within the next. They’ll be back to pick it all up on Friday. What a relief! Boy, did you eat and eat well! Every dish looks fabulous and it sounds like you and Zia had a wonderful visit and lots of quality time together cooking, eating and visiting. So sorry about your wind damage. These storms lately have been quite damaging and all last week and the week before we had trees being cut in our neighborhood from a big storm. That rose is gorgeous! What a color. Welcome home and hope you have a great week, John. I love your recipes AND your lively chats!! It’s like sitting down with a glass of wine (or coffee, depending upon the time of day) with a good friend. We all love Zia !! 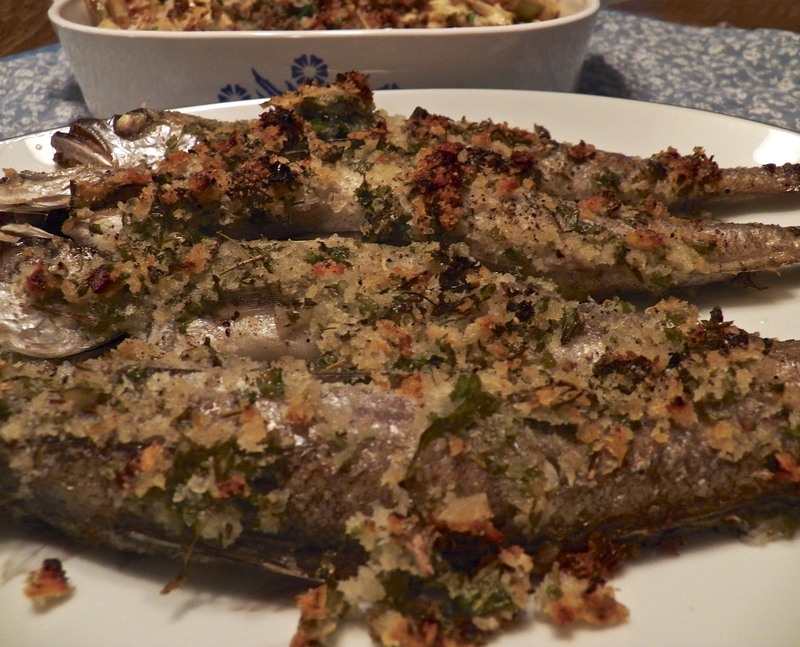 John, this is truly a memorable post – wonderful photos and recipes!! And we’re all soo sorry about the damage. But – as you said, now you have room for Clematis etc. My Clematis is looking FINE this spring! I was thinking of posting it on my next blog !! I hope you do post your clematis in bloom. I’ve 3, the most spectacular had to be trimmed back this Spring, That trumpet vine had sent out runners behind the clematis and they sprouted. Eventually they would have overtaken the clematis and killed it. Early spring, I cut back the clematis, before it “woke up”, and dug out the invading trumpets. This is why I want that vine pulled out and not reattached to the garage. It has sent out runners throughout my yard and rosebeds, as well as my neighbors. It is time for it to go!!! We just got back from DC (and yes, a lovely visit with a mutual friend, post to come), and I’m just catching up. Thank you for the shout out John, I do know what you mean about being user ‘friendly’ — I’m starting to experience size issues myself, most recently I’ve had to remove my near-sighted prescription glasses to be able to read anything, large or small. No reading glasses yet, though! But let’s just say I’m not holding my breath, it’s likely closer than I think!!! That gnocchi is TDF! My absolute favourite, of course most restaurants use more cream than Gorgonzola and we usually send it back (we like a good bite of Gorgonzola). I’d love a taste of yours! Zia is very fortunate to have you cook with her, but then again you are very fortunate to have her wealth of knowledge and cooking expertise to draw on. I’m sure your visits are filled with wonderful memories, laughs and tears. Your story makes me miss my dear mother very much, we had such a special relationship. We’re just arranging a trip to your neck of the woods in late July early August and I’m hoping we can meet! I’ll email you the details. Thank you so much, Éva. Despite the trip, your DC adventure sounds wonderful. I ned to get over there! And did we ever have a good time in the kitchen this time around. It was really special. I’m so sorry about the damage to your vine and rose bush John, I’m sure it’ll be the perfect opportunity to plant that new clematis — they have such gorgeous blooms! Thanks, Eva. I love clematis and one that I have has large white blooms. I’m hoping to find one that will, also, bloom all Summer. And then I get to go rose shopping! YAY! They are indeed beautiful vines, and I’m always so amazed at how robust they grow back each year after the very drastic pruning they must endure. Sadly, I’ve not enough of a green thumb to attempt roses so I’ll leave it to your expertise and admire your photos on your blog. Can’t wait for the risotto recipe. I love gizzards and will definitely tell Steve (who doesn’t) that they are mushrooms. Welcome back! I love the picture of her hands. I think there must be thousands of memories stories in those hands. I am glad you are back safe and can’t wait to see the future recipes. The best vacations are always the ones that are spent with the family – eating, dancing, partying, joking……looks like it was a very fulfilling and a happy vacation. And the food looks incredible. 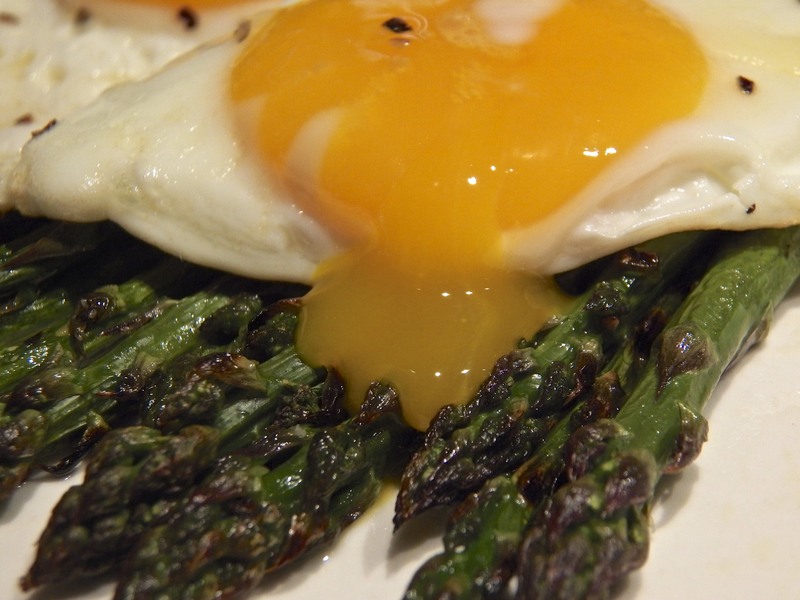 I love the asparagus and eggs idea – my breakfast for tomorrow 😀 welcome back!! Sorry for the hit that your yard took, but I am so glad it wasn’t anything that serious. You’re also right about the vine in the yard. It’s more inconvenience than any real damage. In the end, no one was hurt and that’s all that matters. You certainly did pick 3 stellar dishes. I was so afraid of messing up that lamb! Shooting a good pic for the blog became secondary. I know how Zia likes her lamb and I would not have forgiven myself had I overcooked it. I finally relaxed after that first slice. Whew! There’s nothing wrong with a trip that only involves eating, good company and good conversation! I’m excited to try your simple asparagus recipe, never had with eggs- and runny eggs are the best! Glad to have you back! I hope you do try the asparagus. It’s such an easy dish. It’s just a shame that locally grown asparagus will be gone when mid-summer’s heat arrives. It’s just the light kind of meal that I gravitate towards when the temperatures rise. This sounds like a wonderful visit, John. I am certain Zia must have loved it, too. It made me smile to think of her in the church choir. She continues to have some wonderful interests from what I piece together through your stories. The recipes are all wonderful, but that risotto would have to be my favorite. While you were gone I’ve made the Wonton raviolis with the porcinis and goat cheese twice! 🙂 I was so proud of myself. And they were simply delicious. I hope the storm damage repair isn’t too cumbersome. The midwest storms seem to have been really erratic! Welcome home! Thanks, Debra. I am so glad to read that you’ve made and enjoyed the wonton wrapper ravioli. Once you’ve made a few, the process is a breeze. 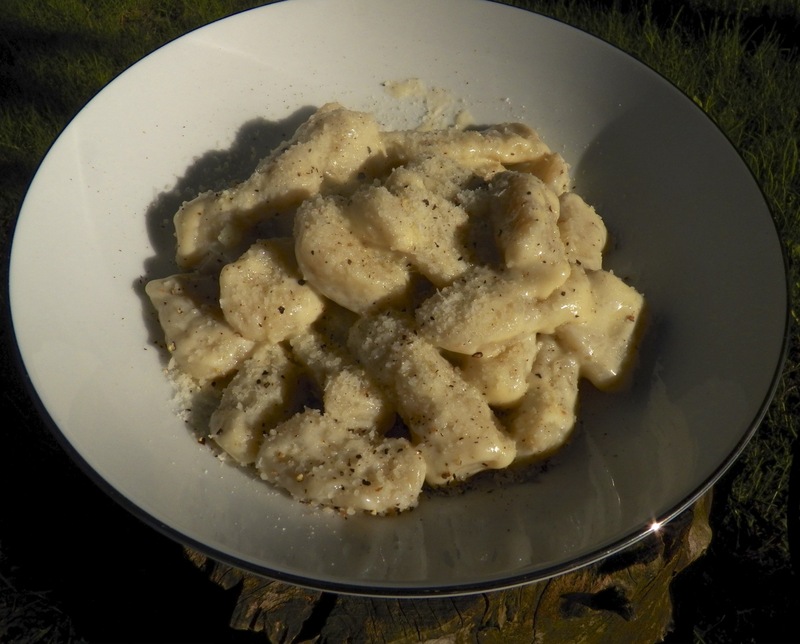 The gnocchi recipe is coming soon and this is one you and your Granddaughters can prepare together. 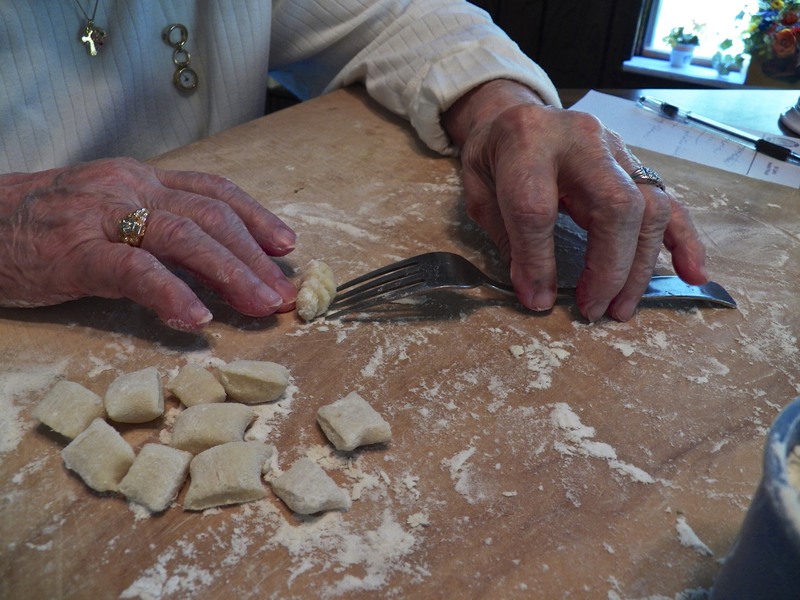 Mom & Zia taught all of their Grandkids how to make gnocchi and some still make them, nearly 30 years later. That sounds like a perfect vacation to me – lots of cooking and eating! I bet Zia really enjoyed your visit too. John I know there are some great jogging trails along the waterfront in greater Chicago area and from the looks of what you ate on your holiday, a visit there this week once, twice or three times this week might be in order. Just kidding!!! I am so glad you had a delightful visit with Zia and love that photo of her creating the gnocchi. I don’t know where to begin as there was so much happening in this post but I do believe your very simple dish of asparagus with parmesean cheese and egg is delightful and fresh morel mushrooms, yum! Buona sera, BAM! I think if I’d stayed another few days, I would have needed to install heavy duty shocks & springs on my car for the ride home. I really hadn’t paid attention to what we were doing until I started to write this post. It was quite a week and I thoroughly enjoyed my visit. Welcome back John; your time together must have been wonderful. 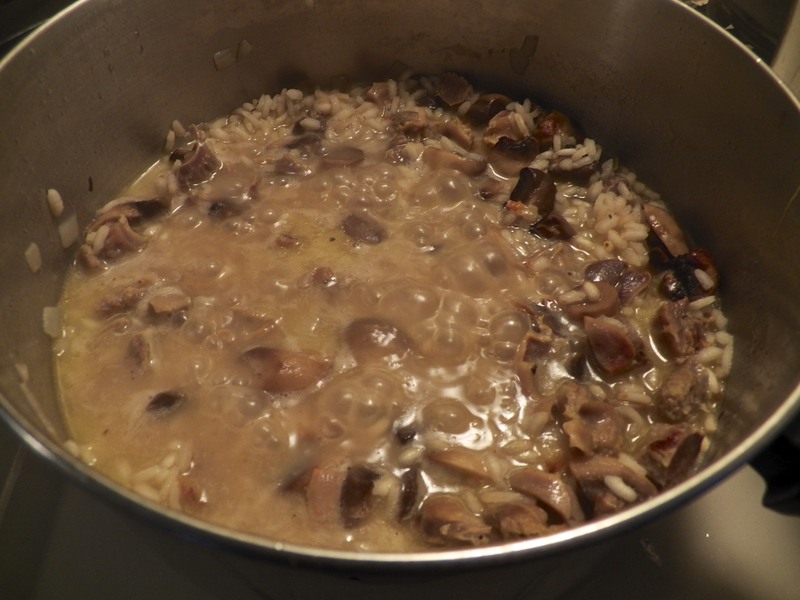 With my porcini abundance, I made mushroom risotto tonight……..loved it! Thank you so much, Elaine. Coincidentally, since writing this post, I read my fishmonger’s newsletter and he has fresh porcini for sale. I will definitely be stopping by to get some. I bet your risotto was wonderful and I hope mine will compare favorably. Now that is what I call a gourmet holiday! Welcome back! Can’t wait for the gnocchi and gorgonzola cream sauce recipe. I’ve had something which I think is similar, in our -old now- local restaurant. Divine! Thank you. It was quite a visit, I must admit. That gorgonzola cream sauce is a snap to make and really delivers on flavor. I hope you’ll agree when I post the recipe. If this was a school essay you would have such an A+. Now I’m starving!!! Oh drool……. lovely and humble post of you John! Welcome home…thankfully you didn’t have any structural damage from the storm. You certainly ate well on your visit and I’m sure Zia was sorry to see you go. I know she must enjoy your company tremendously. Wow John, it sure looks like you had a marvelous time with Zia! Wish I could have been there with you 🙂 The food looks awesome — looking forward to the recipes. I love all the photos except of course for the damage done by the wind. My favorite one is Zia making gnocchi! It sounds like the perfect vacation. Good food. Good conversation. I wish I had a Zia. 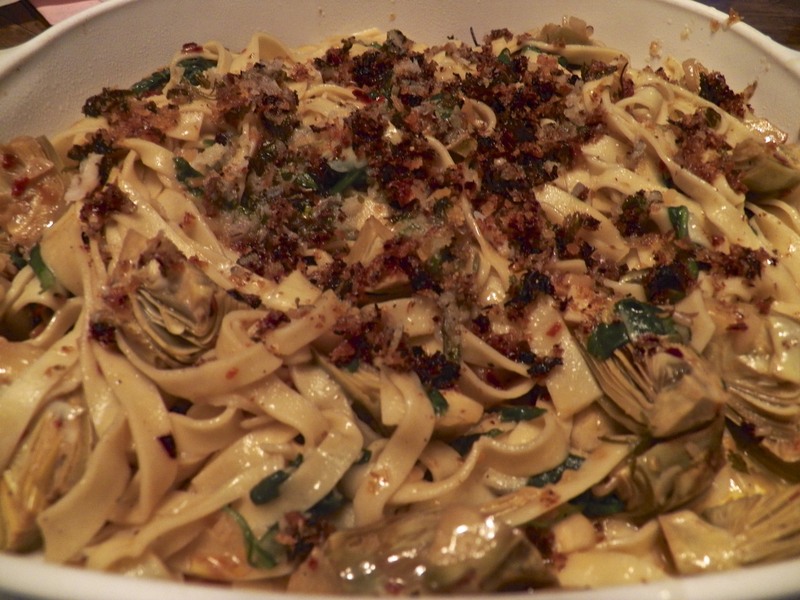 And that artichoke pasta. Sorry about your vine and I am sure the hummingbirds will miss it. Your rose is lovely. Looking forward to meeting her in the near future. And you and Zia must have worn yourselves out! WOW. The risotto is on my MUST MAKE list for summer vacation. Last day of school June 17th. Isn’t that nuts to have to go back after the weekend on a Monday? But I love the variety and fragrant descriptions of your food creations. What a visit. Who needs wireless? Thanks for all your thoughtful and astute comments on my blogs. Thank you so much, Ruth. The vine was dealt with today, finally. The risotto recipe is coming and I hope you’ll enjoy it as much as we do. It’s not like any other that I’m aware of. Is your Zia looking to adopt? Or perhaps she would like to come to our house for a working vacation? Lovely post and photos. 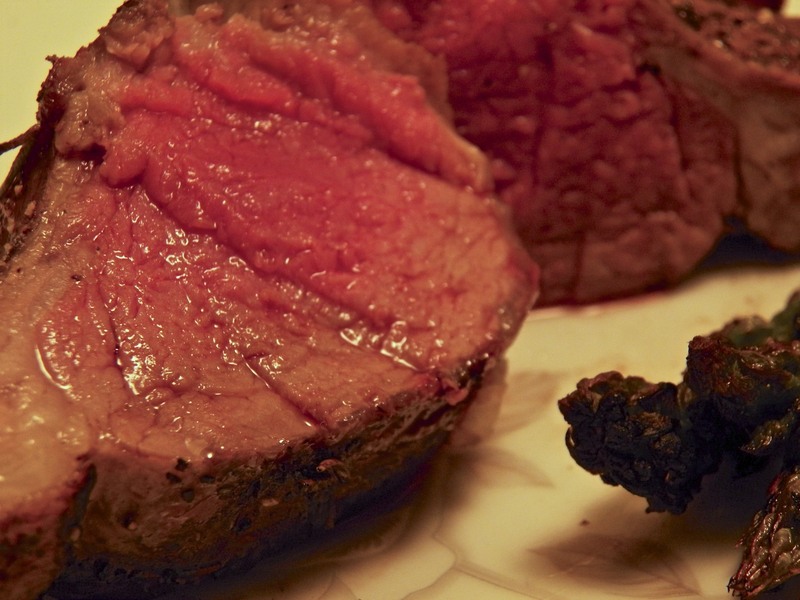 I just finished eating dinner – steak, no less – but I’m hungry all over again after reading your scrumptious blog. Oh, how lucky for you to be able to spend such beautiful moments with your Zia. Treasure them John! Zia’s can be just as precious as mama’s and nonna’s! I just love gnocchi with Gorgonzola! Glad you had a great visit and welcome back! Thank you so much, Lidia. I do enjoy our time together, especially when we’re making pasta, or some other dish, together. You’re so right, too. The time is really precious. Welcome back! And what a feast you had! I can’t wait to see the recipes, especially the risotto! Thanks, Jasline. I’d no idea that so many would be interested in a risotto with chicken gizzards. I hope the recipe doesn’t disappoint. Wow, John! Y’all were very busy cooking up sooo many dishes. That had to have been so much fun. That pasta looks so amazing. That’s a beautiful first photo too! Wow, looks like you had a great time! I loved the pasta dish…In fact, all the pictures are so droolworthy! YUM!! And that mushroom dish cooked with chicken gizzards….I am coming! Welcome back John! I can see that you enjoy your time with wonderful Zia. Next time I’ll hide in your suitcase 😉 everything looks and sounds delicious. Want a gorgeously, wonderful time you and Zia had together. I have gained a few pounds just reading and salivating over all the dishes you prepared. Looking forward to recipes, will skip the gizzard in the risotto though. Is that a new rose you acquired? Sorry to learn about the storm damage, but on the bright side, planning a new garden layout is very exciting. Hope you will keep up updated on the progress. Thanks, Norma. This was a wonderful visit and we enjoyed working together. You can just as easily make the risotto without the gizzards and you’ll still enjoy the dish. 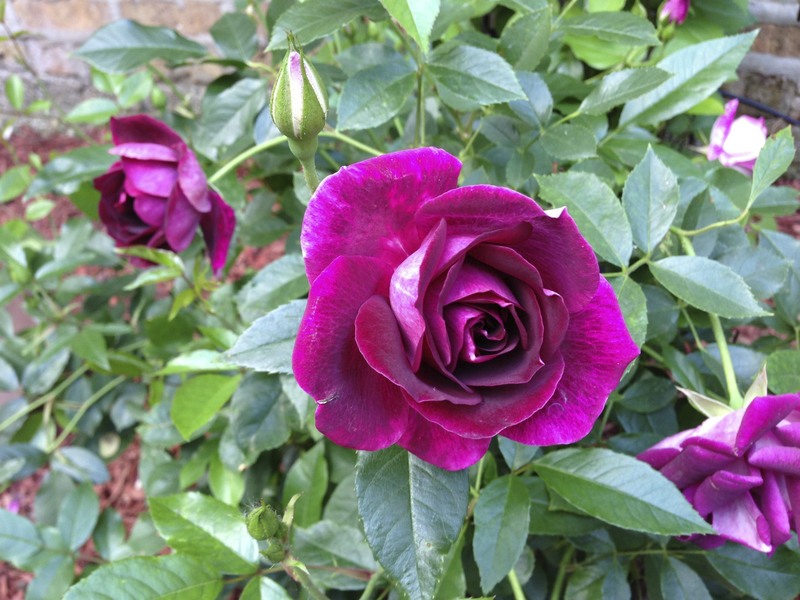 Yes, that’s a new rose, Iceberg Burgundy, and has such a rich color. Once I get things settled in the yard, I’ll formally introduce her to you all. I cook chicken gizzards for Rory (furbaby), but telling me it’s mushrooms wouldn’t get me closer to trying it. Although I’m sure it is delicious to those brave eaters. I will however have a double serving of that asparagus. I love poached eggs on my asparagus! And you can keep the chilly temps! And such beautiful gnocchi! Your Zia sounds like a beautiful person. So glad you get to spend time with her. Sheer heaven, through and through. What people would pay for a cooking tour such as the one you experienced. 😉 Seriously, I think your Zia could have a very successful little business for those cooking types (like ME) who would pay hand over fist to cook alongside her and eat like THAT. Sorry your return home was a bit surprising. Good luck with the landscaping. Everything about this makes me feel happiness. Well, except that storm damage. (I feel your pain on that one). What a wonderful trip, and with such amazing food. Again. You’re a lucky, lucky man John. I’m so glad you shared this with us. Thanks. Thanks, Cam. We really did cook up a storm last week. I was kind of surprised when I wrote this post and saw it all listed. When I remember having dial-up at home, it was a miracle! Now it’s like using a rotary phone and having to wait for the dial to return after each number. Heaven forbid the number your dialing has 8′s and 9′s in it. I’ve used my iPad for many things but I’ve got broadband at home and there’s no problem accessing the internet. In Michigan, I’d have to drive 30 miles to get to a free WiFi spot. Without it, I’m left with “Edge”, which some consider to be 2G. If a post is full of photos, it will time out before it loads. Talk about frustrating! Going “unplugged” though, once I got over the shock, was really quite nice. I wouldn’t be able to make a habit of it but, for a change, it was OK.
Looks like you had a wonderful time. I simply love the picture of zia’s hands making gnocchi. They remind me my nonna’s hands. You are right: a picture is worth a thousand words. What special memories you have of foraging for morels. Mom and Zia wee little girls and they’d go mushroom hunting in Detroit, though the Detroit back then is a far cry from the Detroit of today or even of my youth. Neither Mom nor Zia would ever dare pick mushrooms later in life. Grandma knew which to pick and they were too young to retain the knowledge. And yes, Judy, cooking with Zia is a special treat. We do enjoy our time spent in the kitchen together. My mouth is watering . . . how will I ever get to work now? Sorry John that you hit the nasty weather we had in MI earlier this spring. I hope at least you did enjoy visiting Zia and did find lots of the wonderful local asparagus. Nothing like fresh-picked MI asparagus, that lovely purple green with the nice close-packed tips. I just much on them raw sometimes. Yum. Thank you and yes, we took full advantage of the asparagus. Although I love them roasted, when this fresh, the less heat applied, the better. They are such a treat! 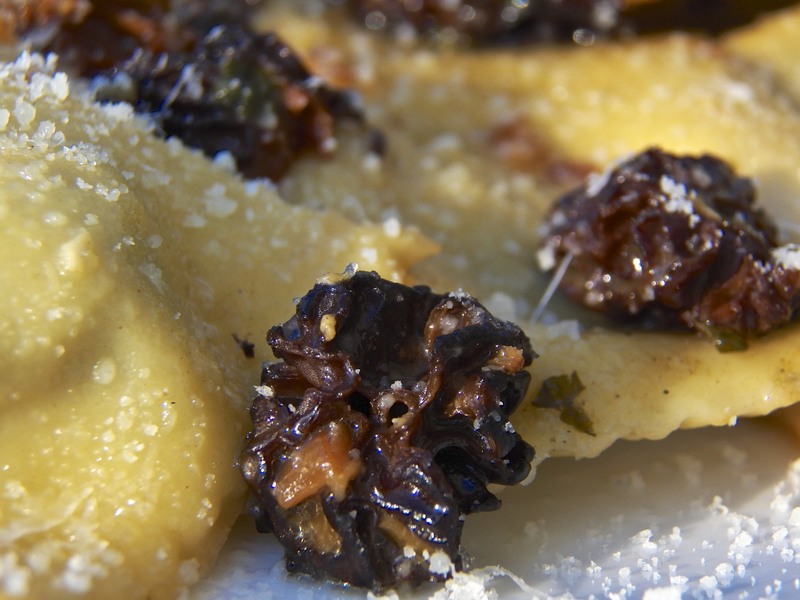 Dear John, your ravioli are spectacular as well as you gnocchi. I make gnocchi but have never attempted ravioli. Thank you so much, Mary Frances. Did you see my wonton wrapper pasta post? 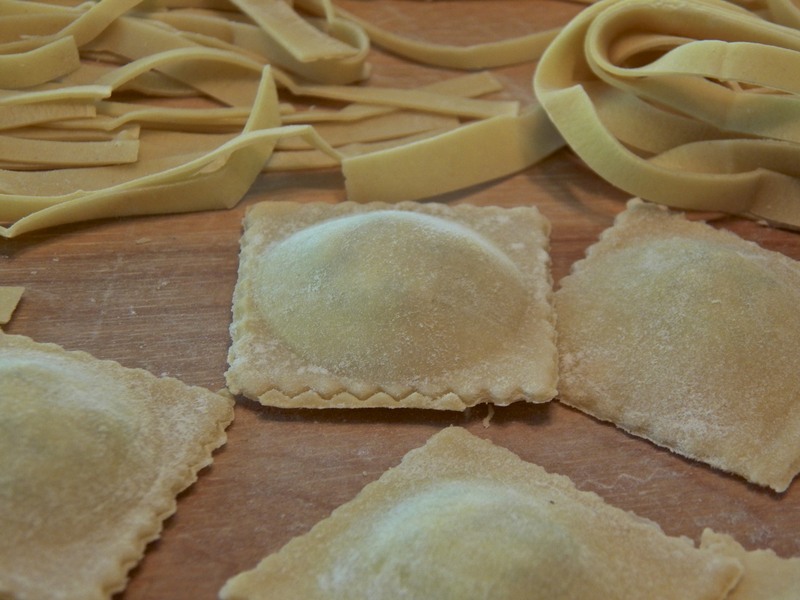 Surely you could make ravioli using wonton wrappers. It is much easier than you might think and with your skills in the kitchen, I bet you’d create some fantastic fillings. Sorry that you’re still having problems following me and I’m very appreciative that you’re coming here without “being told”. Considering the horrific damage some areas have experienced, a downed vine is really nothing more than an inconvenience. Even so, it’s been handled and now I can get back to sipping lemonade in my yard — if it ever gets warm enough to want to sip lemonade. Have a great week, Liz. Happy to know that you ate like there’s no tomorrw during the vacation 🙂 I do the same. What wonderful story-telling. This sounds like my kind of vacation! Welcome home. Thanks, Susan. It was quite a holiday and I look forward to returning next month. Despite the weather related problems, what a wonderful trip and even better food marathon you had, John! 🙂 I totally love your mushroom risotto and don’t you even get me started on the homemade ravioli and gnocchi, oh my gosh so wonderfully delicious!!! I can’t wait for all the amazing recipes, expecially the gnocchi, that has been on my list of things to make forever! Thank you, Sawsan. It’s unfortunate that her internet service was so poor this visit. I had no chance of showing her any posts, yours included. My next visit will not include a holiday so things should be better. Hopefully things weren’t too bad from the storm damage to your place. Anyone would need a vacation after all of the packing and unpacking you two have done over the past couple years. Get to the coast, sit back, relax, eat, and toss back a few. You’re sure to return home refreshed. And if your pants aren’t a little snug around the waste, you didn’t do it right. Great tasting food is part of an amazing vacation and looks like you had plenty of yummy dishes to celebrate a fun Spring vacation. Went to Florida recently and feasted on fresh oysters…6x in 1 week. I love to eat too. Sounds like a wonderful vacation! I love getting out of the city for some quiet time (and yes, leaving my phone and other electronics turned off!). Your Asparagi alla Milanese looks divine, can’t wait for the recipe! It was a great time, Amber. I really do enjoy time spent with my Zia. Since it was so easy to prepare, there is no real recipe for the Asparagi alla Milanese. I did list the steps used to create the dish, however, under the photo. I hope that’s what you’re looking for and I’m here for your questions.